This issue opens with a research article on Resistance Spot Welding of Ultra-Thin Steel that seems to be the next production process for light weight vehicles. While real applications may still wait to definite decisions to be made, this investigation shows that the technology prepares the tools for new breakthroughs. Then we report on a short reminder of the benefits of Pulsed GMAW, now with selectable stored programs, in theory ready for every job. A renowned expert in aluminum welding proposes how to select suitable filler metals in a few cases where special considerations should be taken into account. A new safety issue was raised in Europe for protecting the health of welders who work in proximity to electromagnetic fields. Conscious employers should check what should be done to minimize dangers. Last we report on a complex initiative of the AWS, updating requirements for issuing certificates to welding inspectors. Implementation will take some time but the newly certified inspectors will be more prepared to guarantee adequate workmanship and acceptable welded fabrication. The other columns will be found at their usual place, providing perhaps some interesting notions to curious readers. We welcome comments, feedback and original contributions from generous readers who would like to share lessons they learned during their welding career. Please use the Contact Us Form. 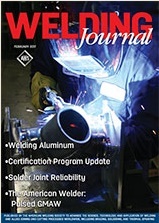 The article published in the Research Supplement of the February 2017 issue of the Welding Journal at page 71-s explains that the interest in welding thin sheets, 0.35 mm thick 600 MPa grade dual phase (ferrite and martensite) steel, stems from the industrial requirements to fabricate economically lightweight vehicles while ensuring structural performance. 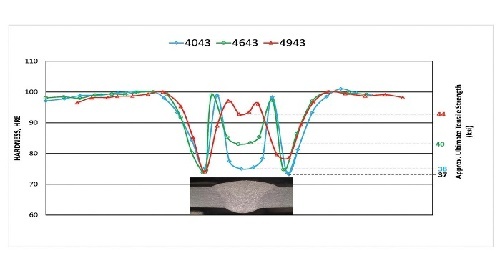 The problem of the investigators was to understand the weld initiation and growth process, by keeping essential parameters fixed, while actual welding was performed within a range of welding times (20–160 ms) at increments of 20 ms. The resistance variation was measured to facilitate the understanding of the characteristics of heat generation during the welding process. The experimental sequence was preceded by a study of a finite element model of the process. The purpose of the investigation was to follow nugget generation and properties while observing microstructural changes, in a suitable progression of modified welding parameters, in order to provide guidelines for future processing schedules. 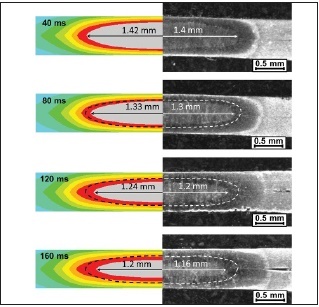 The microstructural evolution during various heating phases was observed by metallographic examination of prepared cross sections of different samples. A unique "double-layer" fusion zone was observed and explanations were attempted by studying temperature changes occurring at longer welding times. The original article provides the details of the calculations and of the measurements that were conducted on resistance welding of 0.35-mm-thick DP600 steel, pointing to the following conclusions. The weld initiated early in the process and grew to reach a maximum diameter within a certain welding time. Afterward, the weld gradually formed layers, inner and outer, with the overall size virtually unchanged. 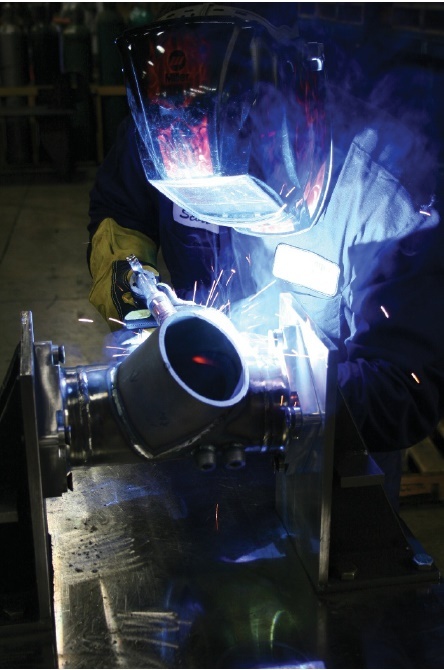 The extent of weld layering increased with longer welding time. The formation of the weld layering was primarily attributed to the temperature history developed for welding ultra-thin steel. The temperature in the middle of the weld zone initially increased rapidly and reached a maximum value at a certain welding time, and fell afterwards. As the temperature dropped, the molten zone solidified gradually from the edge to the internal molten zone, and thus the weld layering emerged. The joint strength increased with the weld size but improved little with layering. From these results it was inferred that high welding current and short welding times should be preferred for RSW of thin steels. Comparison of modeling and experimental results in resistance welding 0.35mm thick DP600 steel. An article published in the February issue of the Welding Journal at page 76 introduces readers to the characteristics and to the benefits of using Pulsed GMAW. In the subtitle the advantages are briefly summarized by explaining that this process provides directional control over the weld pool, quick wire feed and travel speeds, and reduced spatter. And the note of the first photo remarks that Pulsed GMAW may be a good option for companies looking to boost their efficiencies, especially because it can help improve the quality of welds across varying welding operator skill levels. However, where welding shops have been slow to adopt GMAW-P, the reasons may be simply unfamiliarity with the process or fear of needing extensive training or of higher costs. The author writes that in fact the transition from a spray process to learning GMAW-P is not difficult. Changing from a standard GMAW or from a short circuit transfer process requires operator training, but the learning curve is typically much shorter than expected. It is true that the process produces a different sound, which may be unsettling or intimidating to some who were trained to select the perfect settings according to the correct sound. A solid return on investment can be expected as long-term benefit, and a bit of practice and knowledge should put common concerns to rest. In contrast with the continuous metal transfer from a traditional spray process, with pulsed waveform the power source switches between a high peak current or voltage and a low background current or voltage between 30 to 400 times per second. At the low level the background current maintains the arc but metal transfer cannot occur, allowing the weld pool to cool slightly, preventing melt-through. Pulsed GMAW advantages are improved control over arc starts and stops, faster travel speeds, lower spatter, low heat input and a reduction in overwelding and incomplete fusion compared to constant voltage GMAW. Equipment provide multiple programs with different characteristics: operators should check to make sure they have the right program for the job to achieve the best results. It is probably the best than an introductory article can suggest, but new users may become overwhelmed by too many options unless clear instructions are given for finding the most suitable settings for any job. Modern equipment has some forms of automatic machine adjustment intended to ease the task of the welder, once the most suitable among various preprogrammed waveforms is correctly selected. starts and stops, faster travel speeds, lower spatter, and a reduction in overwelding and incomplete fusion compared to constant voltage GMAW. The current ALUMINUM Q&A column, written by Tony Anderson, a world renowned expert, at page 22 in the February 2017 issue of the Welding Journal, provides useful insights for selecting the most appropriate filler aluminum alloy for certain applications. In this column the author explains along a few examples how to consider the different alloys to join in order to select the most suitable filler metal having a good color match upon anodizing. A handrail of 6061-T6 tubing could be welded by 4xxx or 5xxx series filler metal, except that using one from the first series, which contain silicon, would show the weld very dark upon anodizing. Therefore 5356 filler is usually preferred because of color match. A bracket of 6082-T6 is part of a heating system application used at around 250 °F (121 °C). As exposures at such temperatures are detrimental to alloys containing more than 3% Mg (like 5356), because of susceptibility to stress corrosion cracking (SCC), the selection falls on 5554 (whose Mg content is lower than 3%) despite it slightly lower strength than 5356. The third example is a fixture of 6061-T4 to be aged by post weld heat treatment (PWHT) to improve its strength in the heat affected zone (HAZ). Either 4643 or 4943 could be employed, while 4043 would not respond to heat treatment. A complete joint penetration groove-weld procedure qualification test using ½-in.-thick 5083 base metal, is required to meet the minimum specified transverse tensile strength of 40 ksi. in as welded condition. Due to slight differences in actual composition (Mg content) within specification, among three possible filler metals, (5356, 5183 or 5556), the author recommends, for this application, the actual evaluation of 5183 filler metal. For welding an A356.0 aluminum casting to a 6061-T6 extruded section, one should remember the dissimilar combinations to avoid: in particular high silicon to high magnesium and high copper to high magnesium base alloys. In this case as the casting has high silicon content (7% Si) welding with 5356 should be excluded (because of 5% Mg). Evaluation therefore should concern 4043 or 4943). The last item of the column warns against trying to weld specific aluminum alloys that were developed for improved machinability by the addition of small amounts of metals like lead, bismuth or tin. Fastening of such alloys should be performed by mechanical means or by adhesives. Readers are urged to seek the original article quoted above for learning subtle details omitted in this summary. It is a nice to have helpful publication. How do you measure your shop’s performance? Accreditation: QC17:2015 Specification for AWS Accreditation of Certified Welding Fabrications. 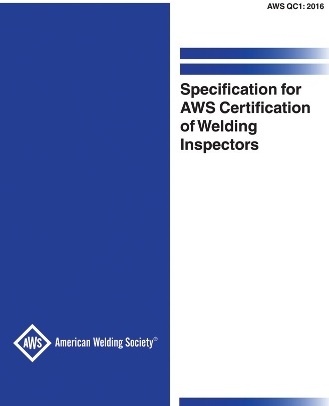 This specification establishes the procedure by which a welding fabricator may seek, obtain, and maintain accreditation from AWS to participate in the AWS Certified Welding Fabricator Program. This standard also defines the requirements for a company’s compliance with welding-related functions as described in AWS B5.17, Specification for the Qualification of Welding Fabricators. This specification establishes the procedure by which a welding fabricator may seek, obtain, and maintain accreditation from AWS to participate in the AWS Certified Welding Fabrication. Backfire is the momentary recession of the flame into the welding tip, cutting tip or flame spraying gun, followed by the immediate reappearance or complete extinction of the flame with a loud sound. Carrier Gas is that used to transport powdered material from the feeder or hopper to a thermal spraying gun or a thermal cutting torch. Dilution is the change in chemical composition of a welding filler metal caused by the admixture of the base metal or previous weld metal in the weld bead. It is measured by the percentage of base metal or previous weld metal in the weld bead. Erosion in brazing is a condition caused by dissolution of the base metal by molten filler metal resulting in a reduction of thickness of the base metal. Flaw is an undesirable discontinuity like a lack of homogeneity, not necessarily unacceptable. Gas Cylinder is a portable container used for transportation and storage of compressed gas. Hardener is one component of a two components system (the other is a resin) forming a two components adhesive. It is important to maintain the prescribed ratio of the resin and hardener in order to obtain the desired cure and physical properties of the adhesive. The two components are only mixed together to form the adhesive a short time before application with cure occurring at room temperature. An article published in the February 2017 issue of the Welding Journal at page 40 informs readers that a new European Law requires protection of workers from exposure to electromagnetic fields by assessment of possible damage. The danger stems from the fact that the effects of the action of Electromagnetic fields on the human body do not make themselves perceived by the casual observer. The assessment of high levels of Electromagnetic radiation has to be determined for the surroundings of equipment known to emit dangerous radiation, like resistance welding, some arc welding processes, induction heating and magnetic particle inspection. Assessment of the level of danger by measurement or calculation is therefore required. Moreover safe exposure limit values are difficult to establish. There are separate action levels, which are limits for the external magnetic field, for the body and limbs, depending on the degree of danger. The EMF needs to be assessed at various positions around the welder, and the frequency of the field needs to be taken into account. Most processes will generate multiple frequencies, and the field for each frequency component needs to be accounted for. To make assessment simpler for health and safety officers and supervisors, a consortium of European organizations has developed specialized software called EMFWELD. The user enters details of the equipment, the welding parameters, and the operator position. The EMF exposure is then calculated based on an extensive database of results obtained from magnetic field waveforms from different processes and equipment. An assessment against the three action levels (low, high, and limb) in the directive is provided in the assessment report, which also includes exposure limit values where data are available. A map of the field around the equipment is generated by the software so that minor adjustment in operator positioning may be readily made when necessary. Wherever calculations reveal that only low action level is present, no further action is required. Readers are urged to seek the original article and its references. EMFWELD is available online (emfweld.com) and requires no download or installation. Besides the calculation software, Readers are urged to download from the above site the informative publications offered that add further knowledge on this matter. The Page of the Month is simply expanded in its content by adding the information, supplied in this publication (3), relative to Pulsed GMAW. But the information reported is new, published in the last issue of the Welding Journal, and reported above (3). Additional information on Pulsed GMAW is available in selected publications listed in www.asminternational.org upon typing the title above in their search window. Relevant articles are available for download at no cost to ASM members, and for a small fee to all readers. Readers are invited to submit their own experience on the subject, especially on how to optimize the working parameters for the jobs involved. Comments, feedback and questions are welcome: please use the Contact Us Form. 9.1 - Acoustic Emission is a measure of integrity of a material, as determined by sound emission when a material is stressed. Ideally, emissions can be correlated with defects and/or incipient failure. 9.2 - Banded Structure is a segregated structure consisting of alternating nearly parallel bands of different composition, typically aligned in the direction of primary hot working. 9.3 - Cam Press is a mechanical forming press in which one or more of the slides are operated by cams; usually a double-action press in which the blankholder slide is operated by cams through which the dwell is obtained. 9.4 - Daylight is the distance, in the open position, between the moving and the fixed tables or the platens of a hydraulic press. In the case of a multiplaten press, daylight is the distance between adjacent platens. Daylight provides space for removal of the molded/formed part from the mold/die. 9.5 - Earing is the formation of ears or scalloped edges around the top of a drawn shell, resulting from directional differences in the plastic-working properties of rolled metal, with, across, or at angles to the direction of rolling. 9.6 - Failure is a general term used to imply that a part in service has become completely inoperable, or is still operable but incapable of satisfactorily performing its intended function, or has deteriorated seriously, to the point that it has become unreliable or unsafe for continued use. In the February 2017 issue of the Welding Journal at page 36 an article with the above title was published for information of all current and future AWS welding inspectors wishing to hold a valid Certification document attesting to their recognized status. The article reports on a number of revisions made in the governing document AWS QC1:2016 updating the requirements established nine years earlier. The phased implementation was initiated this past January. Some of the changes affecting the continuing validity status of certain of the Certifications involved are reported in the referred note. 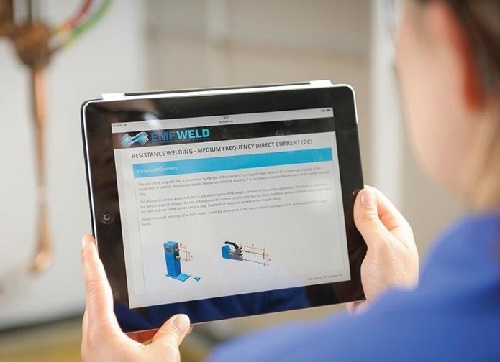 AWS B5.1, Specification for the Qualification of Welding Inspectors, establishes the requirements for qualification and defines the body of knowledge applicable to welding inspection personnel. AWS QC1 sets the certification requirements for the AWS Certified Welding Inspector program. It is clarified in the note that subclause 6.1.4 allows an alternative method for individuals to achieve the Senior Certified Welding Inspector (SCWI) status by earning endorsements. However it is noted that most of the mandatory and elective endorsements have yet to be created and approved. You cannot obtain a SCWI with the existing endorsements. Structural Steel, Structural Aluminum, Bridge Welding, Railroad, Aerospace, API 1104 Pipeline, Structural Drawing Reading, Structural Bolting Inspection, ASME Pressure Piping B31.1 and B31.3, and ASME Pressure Vessel Section VIII, Div. 1. The note reports that direct supervision, to allow the work of Certified Associate Welding Inspector, has been clarified and defined as active supervision, meaning "direct on-site or readily available supervision" by a CWI or SCWI "in the form of necessary instructions to assure that the CAWI can perform specific evaluations as specified by the employer" (subclause 4.4). New rules are enacted to enforce that, in case of interruptions, the lapse time of practical work and experience as CWI be at maximum two years, for an individual to apply for Senior CWI, without first re-establishing CWI Certification. Examination requirements were modified to allow for a certain measure of flexibility for the examiners judging candidates. New rules were applied also for retesting. Additional facilitations are made possible by allowing some of the testing to be performed on computer-based testing facilities, except that the AWS Certification Department is not planning to implement them any time soon. Visual Acuity requirements are formalized and implemented within established time frames. Certifications will include a photo of the certified welding inspector. The article includes also items like Code of Ethics, Rules of Conduct, and Practice where language was added to clarify applicability and avoid misrepresenting actual validity certification status. Renewal limits are established while clarifying the validity durations. Finally the article recommends to all affected by correct interpretation of applicable rules to study the original documents and to pay attention to nuances that cannot be summarized adequately in partial presentations. The article concludes that it is the responsibility of first-time applicants and renewing CWIs and SCWIs to carefully identify how the implemented changes will affect themselves. The latest version of AWS QC1 contains significant changes. That's very late (but not too late) for the new year wishes from my side! Note I continue to forward each PWL (after reading) to our Welding Eng. and our (new) QA/QC Manager which is also (but not effective) Welding Eng. I hope you will get some questions or feedbacks from them ... Wait & see. We got a comment from our attentive long time friend and mentor Anthony Rangus, who is probably unique in reading and paying attention to each word appearing in each issue of our PWL publication. Your definition "Vertical Down is a nonstandard term for downhill" is misplaced. Please see ASME IX paragraphs QW-405.1, 405.2 & 405.4(d) as well as EN ISO 6947 & how positions PF & PG are defined. Vertical Down is used worldwide." You are right as usual, I will report your correction next time. To my partial justification, the incriminated paragraph appears at page 805 of the Welding Handbook, 9th edition, Volume 1. AWS has always marched to a different drummer. I was not being critical but wanted to show that the majority of the world does not drink from the AWS glass, as much as they would like it too. Keep up the great work with Welding-Advisers. I read all of it each time you send it. 14.1 - Aluminum Welding Technology Seminar. 14.2 - ASME Section IX Seminar. and June 12–14, Houston, Tex. “PD 190” or contact Marian Hess, hessm@asme.org (212) 591-7161. 14.3 - Brazing Training Seminars. Three-day intensive training programs in all aspects of brazing from fundamentals to advanced concepts. dan.kay@kaybrazing.com or call (860) 651-5595.